Arrietty and her parents are Borrowers: small creatures that aren’t even 5 inches tall. They live under the floorboards and sneak around in the walls of the human home they live in and use just what they need to survive comfortably. That could all change when Sho comes to live in the “Beings” home and discovers that there are “Little People.” Can this visitor be trusted to keep their secret? 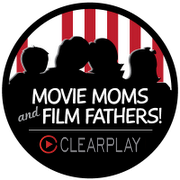 Find out at your next Family Movie Night with this beautifully sweet, simple story! 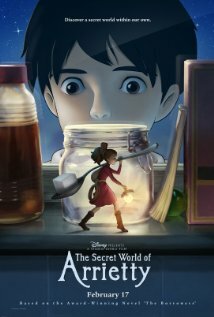 Click here for the full review of The Secret World of Arrietty. *Arrietty and her father need to collect sugar cubes. Collect sugar cubes, or better yet, some sugary treats for your Movie Night. Choose your family’s favorite sweet treat, or let each person pick a dessert or snack to share with everyone else. *Arrietty and her family have soup and bread for dinner. They also use our giant crackers to crush up and use for cooking. Serve soup, bread and crackers for dinner with your family like the small folk. *Borrowers use what they find, and what they can take without being noticed. Leave out some ingredients (or pictures of ingredients) in unusual places around your house to let your family help you “gather up” dinner. For example, you could tell your kids to go look around the yard for ingredients, where they will find pictures of noodles, cheese, sauce, etc. to make Lasagna. Have them bring everything to you and amaze them with what you’re able to create out of their finds. *Arrietty’s mother gets caught in a jar. Serve your drinks in jars, decorate with jars of fruit, or keep supplies for the other activities in jars until you use them. *Arrietty gathers plants and flowers out in the yard. 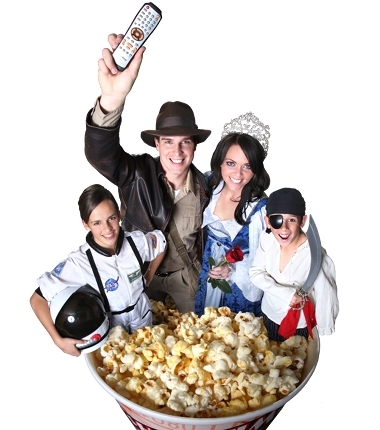 Pause the movie and send everyone outside to collect some interesting things from your yard. Have everyone take a moment and imagine how Arrietty could use what they found. *While your family is watching the show, go leave a note and treats at the door or window. When Arrietty finds the note from Sho in the window sill that says “You forgot something” let your family go find the treat they “forgot” as well! *Pass out coloring pages for your kids to work on while they are enjoying the show. *Hold a Borrowers scavenger hunt for your family. Things you want to be sure and include on your list of things to find are: A sugar cube, pin, tissue, safety pin, cracker, and other small, interesting items like buttons, thimbles, raisins, and anything else Arrietty and her family would love to use. *Bugs that are little to us, like lady bugs and potato (rolly-poly) bugs are quite big to Arrietty. Have your children image what it would be like to have bugs for friends. Let them tell you about which bugs they think they would like to be around and which they would dislike even more if they were little(er). *Sho moves out to the country for some peace & quiet before his operation. Have your family make some cards for someone you know that isn’t feeling their best, or see if your local hospital or care center accepts cards for forgotten patients that would love a little attention.